Hey humans! How are ya doin’? It’s been a while since anyone has blogged (ahem, Christine, lol), and there’s a LOT goin’ on, and I thought you’d maybe want an update. Well, first, and most importantly… I’m going to be adopted!!! My new dad is AWESOME! He’s taken me on a couple outings, like to Shawnee Mission Park for a walk, and he’s given me cheeseburgers! He’s moving to a new house soon, and that’s when I’ll go to my forever home. I’m really excited… and I know all of HSGKC’s staff and volunteers are happy for me, too! 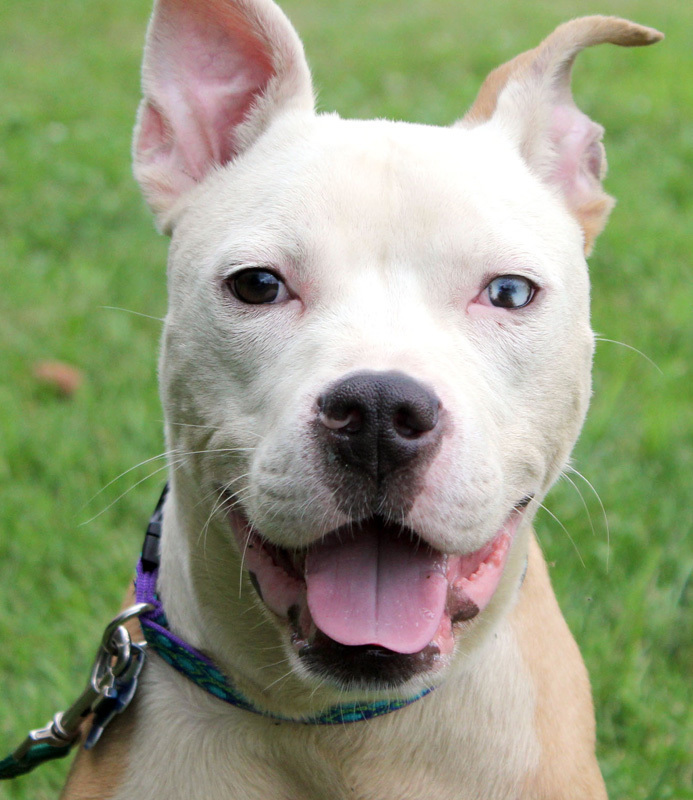 Shiloh went to a foster-to-adopt home, and he’s officially gonna be adopted on Saturday! 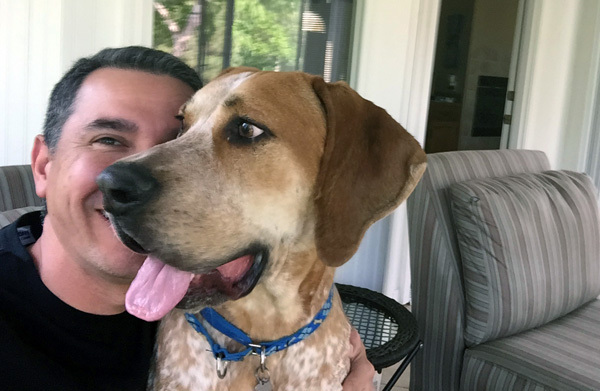 Who wouldn’t want to adopt either of us… we’re handsome boys (but don’t tell Shiloh I said that about him, I don’t want him to have even more of an ego than he already has). The BEG Program is coming along well, too! We’ve had some awesome volunteers come in for a few sets of HSGKC BEG Obedience Class 1.0, and all the dogs have graduated! Pete’s wanting to add an Intermediate Level 2.0 soon. And… the agility equipment is here! It’s all put together and set up in a real nice yard just for agility. Pete wants to do a demo soon, and will be teaching an agility class, too, so he’s teaching Orchid some agility stuff, and showing Christine and Bianca, Amber and Mia, and Harrison and Merrick how to do things like the A-Frame and some jumps and stuff. I’ve heard all the dogs are doing well and are having a lot of fun learning new stuff! I think this is so cool for the dogs here because it makes their everyday life better while they’re waiting for their new homes! And, it wears them out, too! Bianca going through the Tire Jump! The BEG Program isn’t just about training and agility, it’s about doing extra stuff to give us more full lives while living here, and help prepare us for our forever homes. Like Katie takes Diesel on outings to different parks and places because he’s kind of a nervous dude, so it’s good for him to go out and see new things. Or like when Harrison took Porter home for an overnight at his house, and Amber took Diesel for a couple overnight visits, too. All these things are so good for us! One other thing… there’s gonna be a satellite adoption event at Brookside Barkery and Bath on Saturday, June 18th from 11am -3pm. I’m adopted, so I’m gonna hang here and supervise some of these youngsters! But there’ll be several other adoptable dogs to meet, so even though it’s gonna be hot, if you have time, you should go meet a few dogs! I’m gonna go for now, but I’ll let ya know when I’m goin’ home! Hello humans! 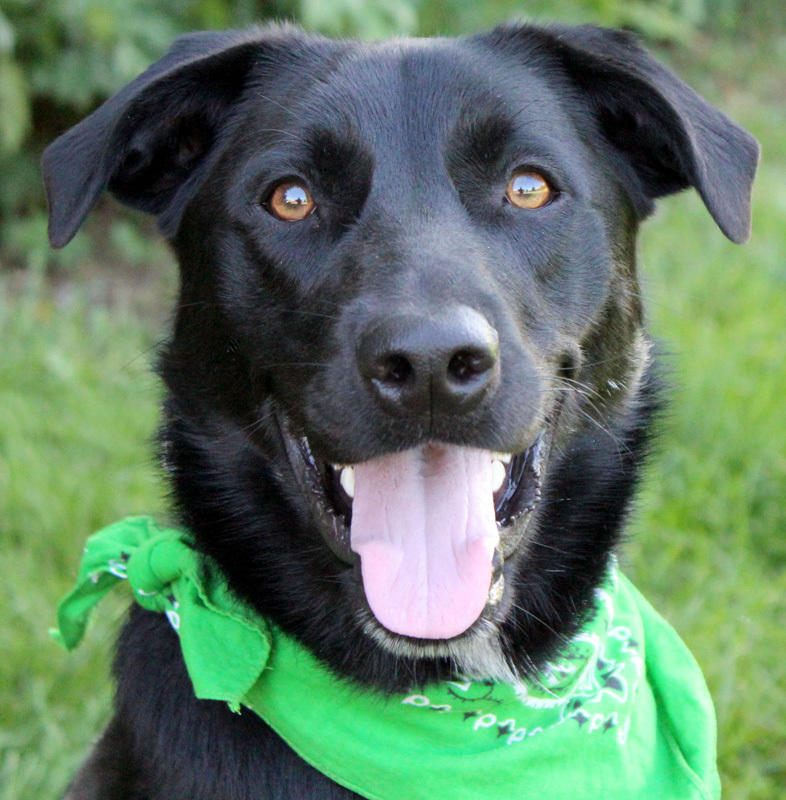 I’m Joker (and more recently known as River), and I’m a 16 month old Lab/Border Collie mix. I have a cool story to tell you about me and my journey from being at HSGKC to being an Alert Service Dog in Training. My story starts back in July, when I was surrendered by my owner because of a real bad wound I had on my back (I had either a wound or a chemical burn that got infected), and they couldn’t afford to take care of me, so I came to HSGKC. 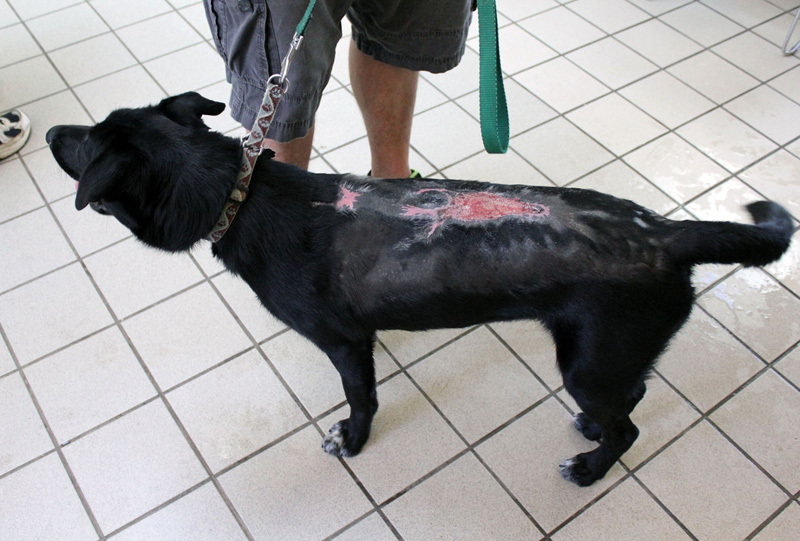 After my wound healed a bit, our humans started to let volunteers take me out in the yard to play and go on walks. Well, one day, Pete was watching me play fetch with a volunteer (I LOVE playing fetch! ), and when Pete noticed how good I was at bringing the toy back to the volunteer over and over again, he saw something special in me. He contacted his friend, Eliodora, who is a Canine Working Dog Recruiter (and she does a LOT of other really cool stuff, too) to come out to HSGKC and see me in action. Eliodora also saw something special in me, and potential for me to go on to do something really cool because of my toy drive. So, she showed Pete, Christine and Amber how to play with me to build up my stamina and keep me engaged with toys. Pete, Christine and Amber worked with me for about a month, taking time everyday to play fetch with me! I loved it!! (On a funny note — one of the things they had to do to keep my energy up and positive was to yell funny stuff when I’d bring the toy back to them… Christine was the silliest ’cause she’d yell stuff like “all right, all right, all right!!! !” which I guess is from some movie she likes… anyways, I thought she was pretty amusing). Me and Pete before I left for Indiana. Anyway, they worked with me for about 2 months, everyday, and all the hard work we did (well, it wasn’t really “work” for me, it was FUN!) paid off. Eliodora came out to see me in action again, and thought I’d be well suited as a Diabetic Alert Dog. 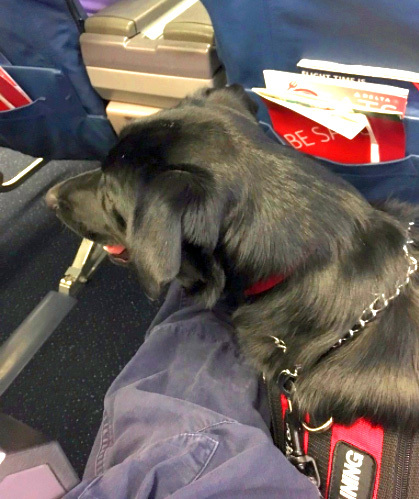 She contacted a friend and colleague with Alert Service Dogs in Indiana… and I was accepted into their training program!!! I went to Eliodora’s house on Tuesday, and Wednesday she took me out to different places to expose me to new situations (and I was on TV, too!) to prepare me for my plane trip and training. I left yesterday, and got to go on an airplane with Eliodora to Indiana! I’m going to start training real soon, and after I finish training, I’ll be matched with a person who’s diabetic, and live with them. I’ve heard our humans talking about different kinds of jobs dogs like me can do (I’m energetic, friendly with humans and other dogs, and I have a VERY high toy drive… meaning I LOVE my toys, like a LOT), from FEMA Search and Rescue, or Wildlife Search and Rescue to Diabetic Alert Dogs to Bomb/Drug Detection Dogs. We’re dogs who have “jobs” where we help humans. We’re the dogs who are in shelters, and will be adopted and sometimes returned because we’re too high energy, we bark a lot, and need a job to do. Most dogs who do these types of jobs come from humans who breed “working” dogs, but what some humans don’t know is that some of us are in shelters, waiting for an opportunity like this, to go on and help humans. I was given an opportunity for a better life when I was taken in by HSGKC and received care to heal my wound, and now I can return the favor and help a human in need. 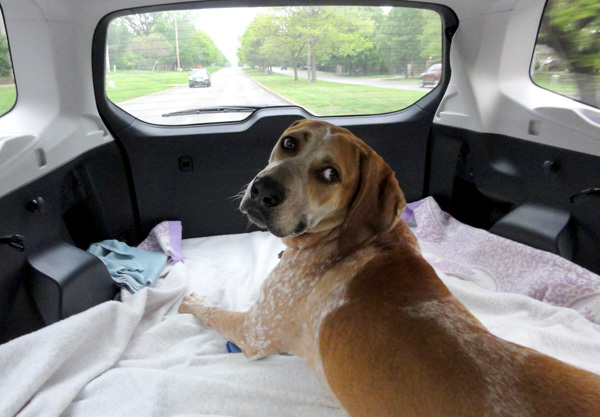 Us “shelter dogs” are just as awesome as dogs from breeders, and my journey is proof of that! I’ll let you know how training goes for me! I’m gonna work super hard to complete training so I can go on to be a Diabetic Alert Dog, companion, and best friend to someone who needs me as much as I need them. Bye for now! heya humans! i’m Merrick, a Lab mixed with who knows what??? our humans took a DNA sample from me to find out what kinda breeds i’ve got in me… i’m kinda curious, too. i’m 9 months old, and the reason i’m here is cuz the person who had me before abandoned me at someone else’s house during a garage sale, and that lady was real worried ’bout me cuz the entire left side of my face was like super swollen!!! i had a bad infection in my jaw, so i went to VCA Welborn Animal Hospital and had to have surgery to drain out all the nasty stuff in my jaw. that’s why i kinda have a lopsided smile… but i think it gives me character! 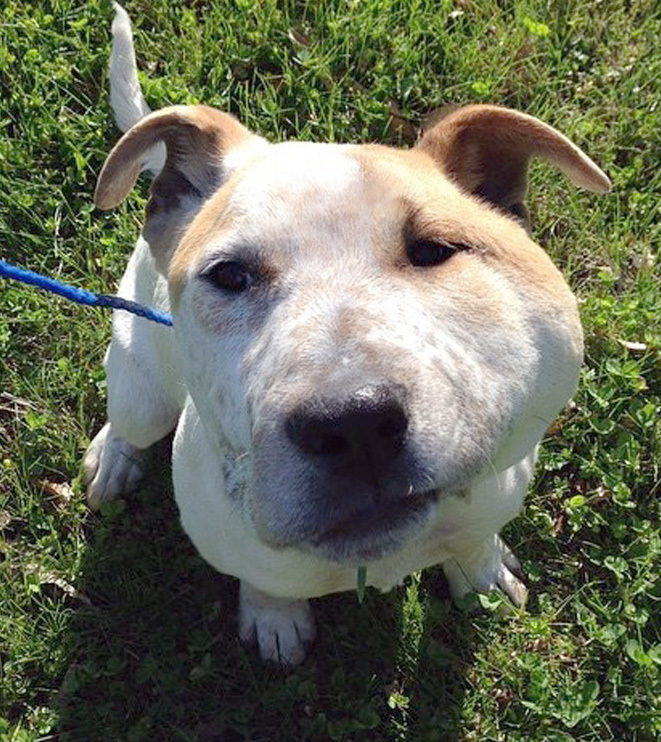 the humans at Welborn, and our humans here at HSGKC got me ALL better, and now i’m doin’ great. the way my teeth line up isn’t quite right, but one of the human doggy doctors here said to wait ’til i’m all grown up before takin’ me to another kinda doggy doctor called a “den-tist” ‘cuz i’m still growin’ so it’s best to wait. i heard there’s gonna be a real big satellite adopt-shun event at the Plaza Art Fair this weekend, Sept 25-27 … i would go to the Plaza Art Fair, but i think i’ll wait ’til there’s another satellite… i think i’m entertaining enuff on my own that i don’t really wanna have to share attention with the other dogs at the satellite, ha ha! but, i’ve heard it’s a real good event, and there are lots of adoptions from it… so maybe someone will wanna meet me even tho i’m gonna hang here! 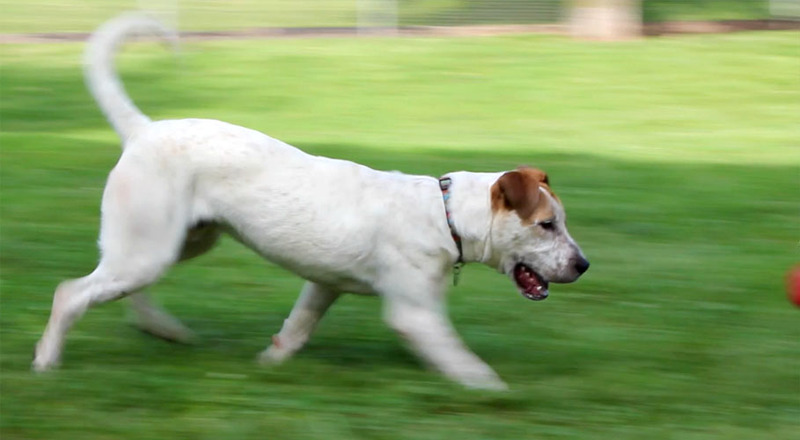 a coupla weeks ago, Christine and Jana recorded somethin’ called a “video” of me playin’ fetch with Christine… it’s kinda hard for me to grab hold of the harder rubber balls cuz of my jaw thing, but i sure had fun chasin’ them, and kinda kickin’ the balls ’round with my paws. then Christine threw a tennis ball in the kiddy pool for me… and that was AWESOME!!! i’d jump and splash in the kiddy pool, take the ball back to Christine (i’m still workin’ on takin’ the ball right to the human who threw it for me), and she’d do it again! i had lots of fun doin’ that, then coolin’ off in the pool! ya gotta check out my video to see how cute i am! then, after i was all wet from the pool, i ran over to Jana and got her all wet! that was funny! i’m excited, too, cuz i started oh-bee-dee-yence classes for somethin’ called HSGKC’s BEG Program, and Pete’s our teacher! i’ve had 2 classes so far with Orchid, Gailen, Bernie, Lucy, and Bianca, and we’re learnin’ lots and lots of stuff! the BEG Program’s gonna have all kinds of awesome new stuff for us dogs to do here while we’re waitin’ for our forever homes, and to help us get ready for a home. so far, i’ve learned how to “sit”, “stay”, “watch me”, “come here”, and i’m workin’ on somethin’ called a “polite greeting” (that’s kinda hard for me cuz we’re s’posed to sit and not jump up on a new human walkin’ up to us, but i get REAL excited when i see humans… so i’m tryin’). we’re learnin’ how to walk nice on a leash, too, and “down”… which i was havin’ a lil trouble with last night, but i think with some more practice i’ll do it real good, too. i like classes cuz i getta do somethin’ different, and i sleep real good after class. plus, Christine (she’s the human who’s workin’ with me… and i think it’s makin’ Hercules a lil jealous, lol!) is SO proud of me, and gives me lots of treats, and pets me and tells me what a good, smart boy i am!!! anyways, all us dogs are real excited ’bout this kinda stuff (like agility… i think i’d rock agility stuff), and the new things Pete and the BEG Program humans come up with for us! gotta go… time to go play fetch! 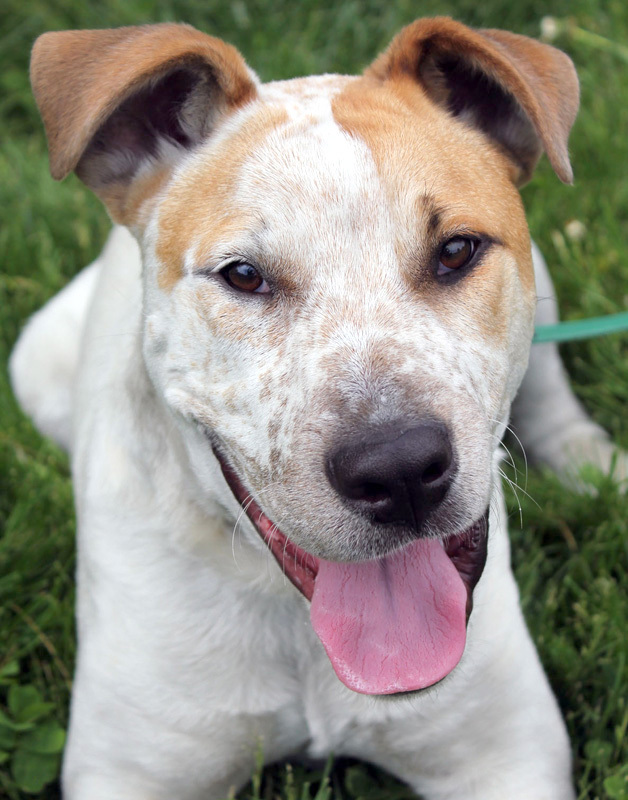 don’t forget to check out the Plaza Art Fair if ya wanna meet some of the other adoptable HSGKC dogs!!! bye! 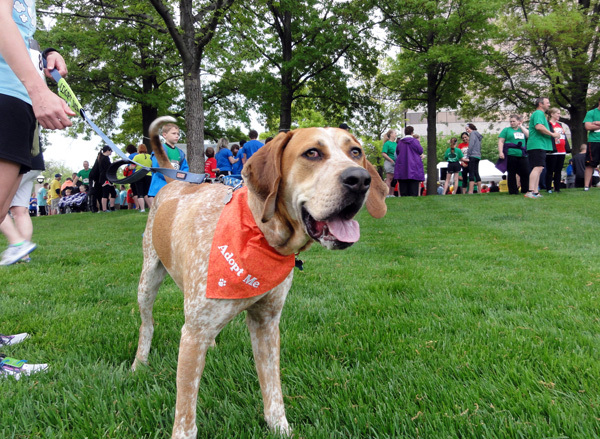 Farley: Meet Me at Art Unleashed! Heya humans! How ya doin’? I’m doin’ pretty good myself and I’m very excited ’cause I just found out I getta go to Art Unleashed on Saturday, August 22!!! So, ’cause I’ve been listenin’ to our humans talkin’, I know this is like a BIG fundraiser for HSGKC with all kinds of stuff called “art work” to bid on in a silent auction (I dunno how ya can bid on s omethin’ if you’re silent, but that’s complicated human stuff I don’t worry ’bout too much), and there’s a live auction for super cool stuff too (like extra special pieces of art work, an’ some other cool stuff). You can still buy tickets if you want… and all the proceeds are for HSGKC! It’s their second biggest fundraiser, and I know it costs lots of money to help all of us dogs and cats here, so Art Unleashed is real important for our humans to keep doin’ what they’re doin’! I’m goin’ with Ethan & Etta and Roxy. I’ve got a good feeling this is FINALLY “my event”… meanin’ some great humans are gonna fall in love with me as soon as they see me and wanna make me a member of their family! 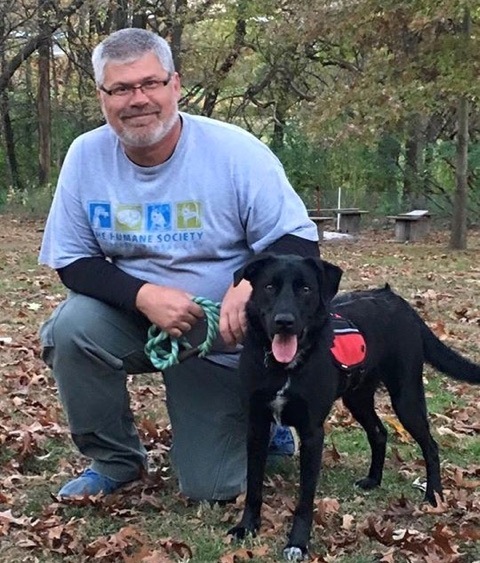 I went to Tails on the Trails last Saturday at Ad Astra Park in Lenexa, and 2 other dogs who went with me got adopted! Bowie went home Monday (I gotta admit, it was real cute watchin’ him crawl on his belly real gentle like to his 2 new doggy brothers who are lil dudes… and I gotta say Bowie’s braver than I am with small dogs… the first one I met, Olaf this lil Chihuahua, barked at me once, and I got kinda scared, so I jumped on Pete, and put my front paws on his shoulder!) Oh yeah, and the other dog who went home is Rupert, he went to his forever home on Wednesday! And, Etta & Ethan were at the event, too, and they are ALWAYS a riot to watch!! They’re silly, and real cute the way they play together and with all the other doggies they meet! Last time I did this blog thingy, I talked a lil ’bout my personality, and some of my quirks, but want to fill you in a bit more ’bout me. A couple months ago, I gotta to go to a 5K walk/run with a volunteer (she’s one of my favorite humans, Angela), and ’cause it was real early in the morning, I got to have a sleepover at her house. It was awesome!! She said I was a real good boy, and I pottied outside everytime, so I’d adjust real quick to that part of bein’ in a home! 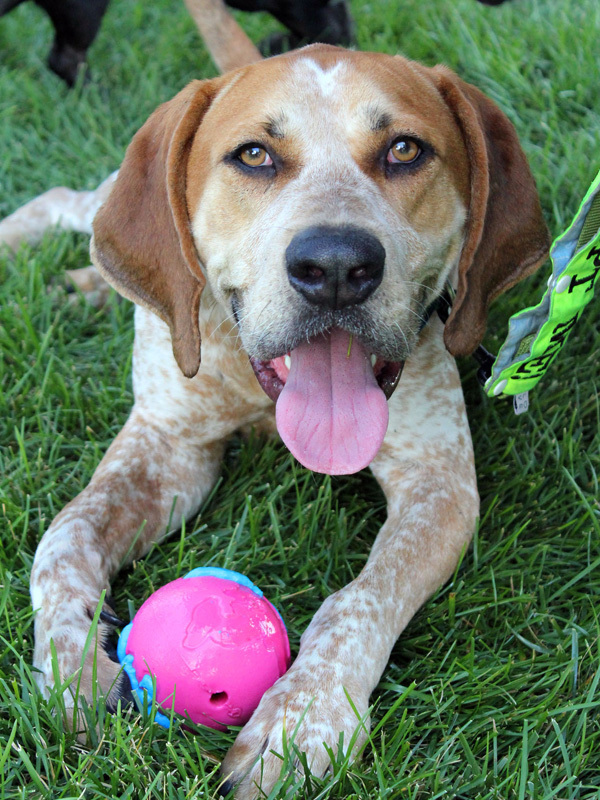 I’d really like a forever home with another doggy like me to play with, I think… I mean I’d be ok as an only dog, too, but it’s fun playin’ with other dogs… especially if I met another Hound like me! I’m still workin’ on my leash manners… but even though I pull pretty hard, I’ve heard Barley is like SUPER strong… and I’m not quite that bad… I don’t pull much after we’re walkin’, like on the Pack Walks. 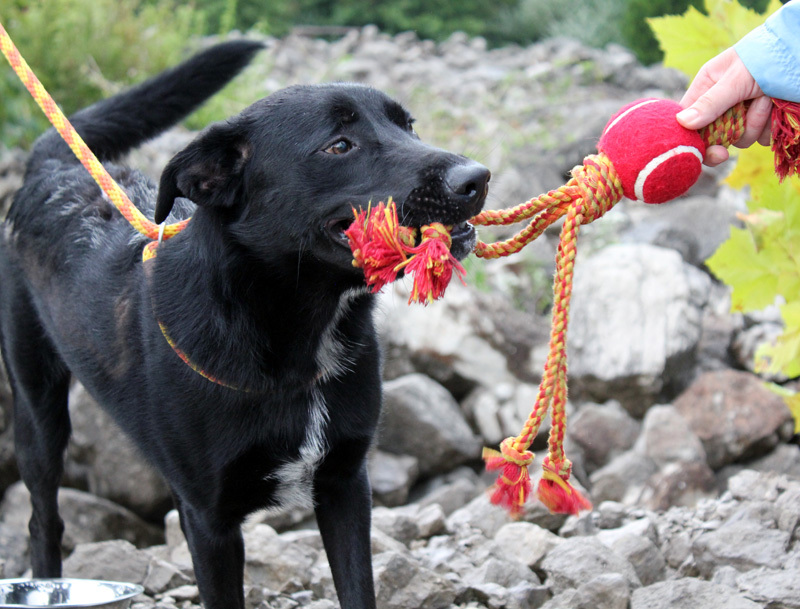 Our humans say I’m smart, goofy, curious… and they’ve FINALLY found hard toys I like a LOT. I’d prefer soft toys… but I’m kinda obsessed with them, and ’cause our humans hide ’em from me, when I do get my mouth round one… well, I don’t wanna let go, but I do… eventually, lol!! I’m gonna go… time to go for a walk! Don’t forget to check out hsgkc.org for more info ’bout Art Unleashed, it’s supposed to be lots of fun — and you’ll get to meet ME there!!! Cross your paws for me ’bout this bein’ the event where I meet my forever family! Bye!! This is me riding nicely in the car for my sleepover. Here I am in the house with my buddy, Ron, and on my best behavior! And finally… getting ready for the 5K Run! It was very fun!